Preis: EUR 56,43 kostenlose Lieferung. Verkauf und Versand durch KELINDO³. Für weitere Informationen, Impressum, AGB und Widerrufsrecht klicken Sie bitte auf den Verkäufernamen. I fell in love with the American quartet after listening to the Jerusalem Quartet's version (thank you, public library! ), which is exciting and beautiful but, as suggested by an amazon review, a bit *too* vigorous to hold up to repeated hearings. Obsessive research/listening brought me finally to this version, which is, to my ears, perfect. The playing here is gorgeous, intelligent, and dramatic without ever sacrificing the light touch that this quartet needs, and which makes it *more,* not less, moving. 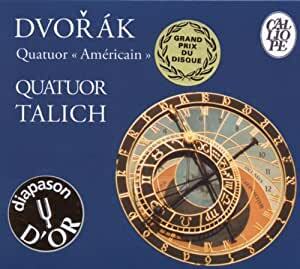 The Talich quartet seems to be the most sensitive of all the others I've heard to structure of the work as a whole (which is probably why it can withstand my totally obsessive listening ;) You will not regret getting this CD one bit. (The 11th quartet is lovely too... ) I have not been able to get a hold of the Talich's later rendition of the American, here: http://www.amazon.com/String-Quartet-Op-96-Quintet/dp/B00006JIQ1/ref=sr_1_4?ie=UTF8&qid=1330363017&sr=8-4 but would be curious to hear how it compares.